Rated PG for thematic elements including some scary images. I imagine fans of Pixar's "Inside Out" might like the patronizing but well-meaning animated Japanese fantasy "Mirai." That's not a knock on Pixar fans (well, maybe a small knock) so much as an up-front acknowledgment that both "Inside Out" and "Mirai" are not only not to my taste, but also do not, in my opinion, speak meaningfully to children. Both "Inside Out" and "Mirai" re-imagine the inner lives of children through the lens of an individual child's innermost thoughts: the emotional turmoil of both protagonists is expressed through literal-minded fantasies that too-neatly explain where bad feelings come from for the sake of curing normal, albeit childish, emotions. The biggest difference between "Inside Out" and "Mirai" is that the consistently arch latter film seems to suggest that imaginary friends and play-dates just happen to child protagonist Kun (Jaden Waldman, in the film's English-dubbed release). This kid, who constantly struggles with sympathetic feelings of displacement following the birth of his cherubic sister Mirai (Kaede Hondo), doesn't daydream: he gets swept up, Walter Mitty-style, in fantasies that simply don't feel like anything a real child would imagine. These hallucinatory interludes are so dramatically under-developed that it's often hard to nod along in agreement with the film's trite but true-enough life lessons. I get why some adults might enjoy "Mirai," but I can't honestly say that I like it, nor can I imagine kids liking it either. I dislike much of "Mirai" because most of the film's Kun-centric scenes (which take up 90% of the movie) are split between the character's un-imaginative daydreams and his full-blast fits. He screams, he stomps his feet, he carries on, and he just won't let up. The fact that a fair chunk of "Mirai" is dominated by a boy tyrant is realistic enough, but that doesn't mean that "Mirai" necessarily says anything meaningful, nor does it say anything in a meaningful way. Even the film's general theme—children can be overwhelming before they learn how to control their emotions—is only hinted at, never thoughtfully expressed. For example: what manner of child literally imagines that his mother is a witch? Maybe he'll sub-consciously (or hastily) make a doodle of his mom as a witch, as Kun does. But what sort of child not only knows that that's how he sees his mom, but also believes that association so much that, when Kun gets lost in a busy train station, he struggles to find his mom in a crowd of women—and only sees doe-eyed strangers and an angry, red-faced witch? "The witch," he cries out, like no emotionally stable child ever. Thankfully, Kun's bouts of screaming are not as long-lasting nor as aggravating as his dry, bald, and head-scratching daydreams of being lectured by everyone, including an anthropomorphized version of his dog Yukko (Crispin Freeman) and a time-traveling teenage version of Mirai (Victoria Grace). These scenes are especially annoying because they feel like lectures from a well-meaning, but hopelessly flummoxed new parent to his child (or maybe just an imaginary child-version of himself ... it's frankly unclear what Kun is supposed to be, in that sense). For proof, see the scenes where Kun imagines he's visited by a dashing version of his long-dead great-grandfather (Daniel Dae Kim), who indirectly teaches Kun how to ride his bike by teaching Kun how to, uh, ride a horse: "If you're scared, the horse will also be scared." Don't get me wrong: I like enough of "Mirai" to sincerely believe that it deserves (at least) two stars. I especially like the uncharacteristically child-like scene where Kun, still in lost in the above-mentioned train station, talks to an automated Lost & Found attendant (and his tiny sentient stop-watch friend). These two (literal) robots make Yuko board a special lost-children-only Bullet Train that's headed to The Lonely Land (whatever that is). Unfortunately, while this scene features several personal, thoughtful flourishes, it's ultimately just a segue to more tacked-on and under-developed day-dreams. Don't get me started on the headache-inducing finale, wherein (deep breath) Yuko's imaginary version of a time-traveling teenage Mirai visits him and delivers the most depressing genealogy lesson ever. She tells Kun that every leaf and branch on their family tree informs some aspect of their respective personalities. Their family tree is then represented quite literally, but when Yuko and Mirai literally fly through it, the tree is all straight lines, musical notes, and harsh vertices instead of, y'know, a tree that Mirai flatly calls "an index of our entire family history." "Index," Kun laughably repeats (because honestly, why would he know what an "index" is). "It's like those card they have for sorting books in libraries," Mirai explains, like no normal hallucination ever. If I were a kid, I'd probably enjoy parts of "Mirai," but not so many that I'd know what to do with the film. 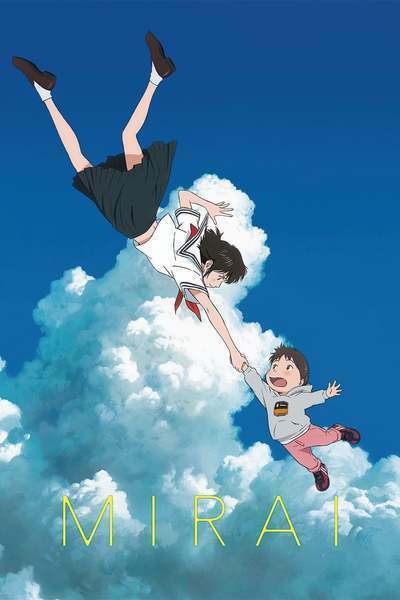 Kids may be smarter than we think, as writer/director Mamoru Hosoda ("The Boy and the Beast," "Summer Wars") argues when Yuko tells his great grand-dad, mid-hallucination, that "this is cool." But Kun's vision of his great-grandpa even inadvertently clarifies what "this" is through too-blunt dialogue during the above-cited encounter): when Kun says "This is cool," he means their familial bond is cool, not his great-grandpa's motorcycle (which they are both riding at the time). But wait, there's more clarifying to come: Yuko's mom corrects Yuko when he, seeing a picture of his great-granddad in a subsequent scene, assumes that he's looking at an old photo of his father ("That's not your dad, that's your great-grandpa"). Yuko doesn't believe her at first, but eventually settles down, and even thanks his imaginary friend, I mean the dead man in the family photo, I mean his great-grandpa: "Oh, I see, so that's who he was. Thank you, great-grandpa." What manner of child talks, let alone thinks, like this? "Mirai" doesn't really speak for young viewers, just down to them.